Spore Origins, a game based on the new Mac and PC game Spore, came out this week for the iPod. Electronic Arts (EA) confirmed that Spore Origins will be released for the iPhone and iPod touch later this month, and EA also plans to release nine more games for the iPod touch and iPhone. Spore Origins uses the iPhone's accelerometer to let you navigate a primordial world. 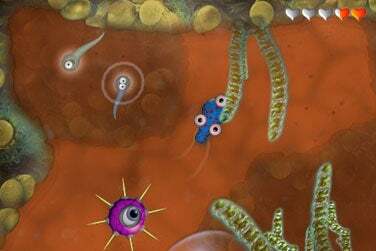 Spore Origins for the iPhone uses the deviceï¿½s accelerometer to let you navigate a primordial tidepool as you try to evolve your spore. Like the iPod game, it features two gameplay modes and also sports 35 levels. You can use a Creature Editor to customize the texture, shape and body parts of your spore, as well. Other EA games coming to the iPhone and iPod touch include Yahtzee Adventures, EA Mini Golf, Lemonade Tycoon, Mahjong, Monopoly: Here & Now The World Edition, SimCity, Tiger Woods PGA Tour 09, Need for Speed Undercover and The Sims 3. EA did not offer a release schedule for those other games.